Happy Friday everyone, I hope you have all had a great week and I wish you all a fabulous weekend. Sorry I haven’t posted anything this week yet, I took my first few days of summer sabbatical to be lazy and rest before I start travelling and creating new content for you guys. Today’s post features another fabulous look from Melissa McCarthy Seven7. Melissa is known for creating fabulous prints and using rich vibrant colours but I really feel she brought it to a whole other level with her spring and summer 2017 collection. Every piece I lay my eyes on I literally fall in love with. This embroidered flutter sleeve dress in this super charged shade of yellow was certainly at the top of my list. Yellow is a must have colour for your wardrobe right now and this shade will certainly have you on trend with a smile on your face. This dress is available in several different prints and I see that the same silhouette is also popping up in the fall collection. It’s a great everyday dress with that special Melissa flare. My favourite thing is the high quality rayon fabric that is soft to the touch and has great stretch. It’s also light weight and doesn’t wrinkle. Combine this with the flutter sleeve that adds interest and drama and arm coverage if that’s what you prefer, the empire waist with a nice wide waist defining band and the swingy uneven hem and you have the perfect summer dress. Just put it on and you are ready for a fun filled day of sun and adventure. In terms of fit I find this dress to be quite generous compared to some other Melissa dresses, particularly I think because there is more give in the fabric. I am wearing the 4x and I would have considered sizing down. You might look at this dress and think that styling it could be a bit of a challenge because of the bright colour and bold print. The way I see it you have two options – stick to neutrals or play up the colours and pattern. If wearing this dress is a departure from the norm for you then I recommend going with neutrals and letting the dress do the talking. If you like pattern and colour like I do then you might want to turn things up a notch which is what I did. And I am sure that doesn’t surprise you guys lol. This look was built on accessories I already had in my collection so I apologize now that they aren’t available. I tried to give you suggestions for comparable ones. Don’t forget to go looking in your closet, you might be surprised at what you find! I loved adding pieces that were solid colours that picked up on colours in the print. These pink mules are from Avenue and with their small heel they were just the right shoe for the part. The neckline is pretty high so I stuck to earrings and bracelets. These black statement earrings from H&M really pop against the yellow. The bangles with the touch of blue and green from Lane Bryant were a more subtle addition. Finally there is this amazing bag from Aldo. I am completely obsessed with the fluorescent colour blocking combined with the black and white print. This bag is a statement maker and was a total score that I got on clearance. I love when I find that special piece that puts the finishing touch on a great outfit. I know that colour and print like this can seem scary for us plus size women but I encourage you to go for it. Maybe it’s on a smaller scale but you won’t know until you try. 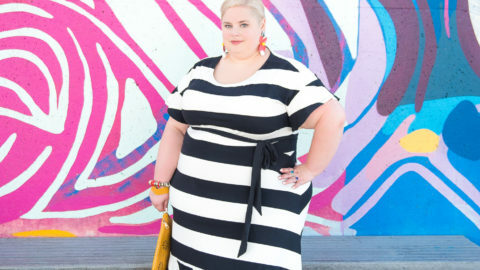 Being fat does not mean you have to wear boring clothes. Have fun and wear what you love because life is too short not to! Special thanks to Rebecca of Rebecca Northcott Photography for capturing this look, it was super windy the day we shot this so it was definitely a challenge, as you can tell by the expression on my face! Beautiful! You look awesome in that dress. Love it! Such a cute summer dress, wonderful photos.